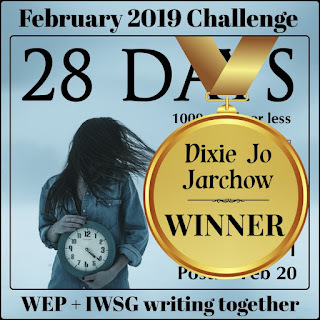 #WEPff #winner Dixie J Jarchow writes about VOICE! 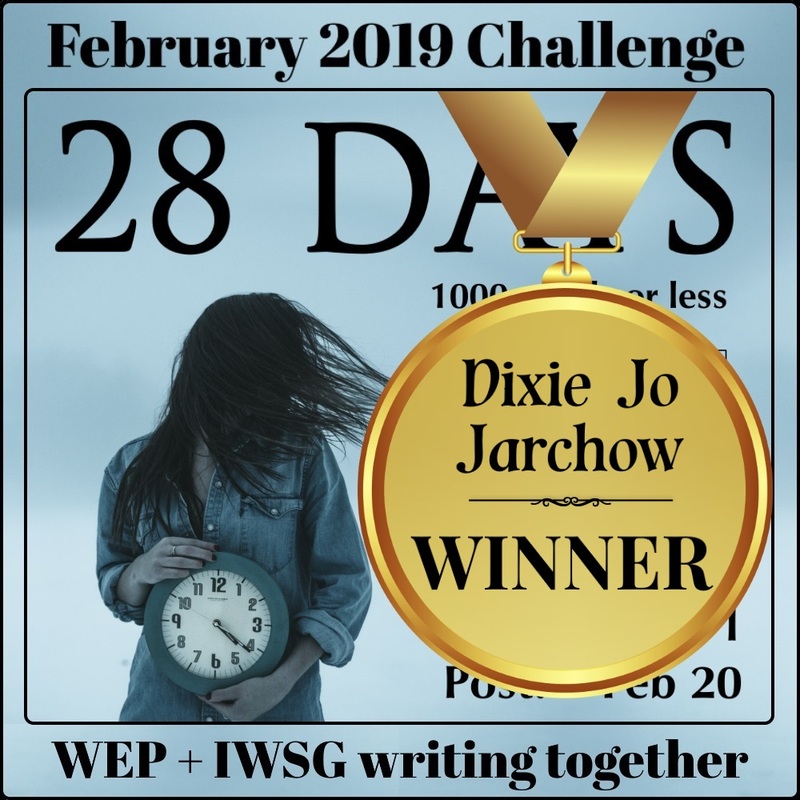 A huge congratulations to Dixie J Jarchow who won the WEP/IWSG February challenge, 28 DAYS. 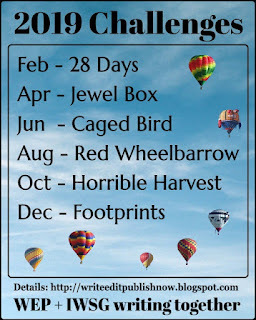 All winners are offered the opportunity to write a guest post on whatever topic they choose, but we always like to read something about their writing journey. Our judge Nick Wilford said on choosing Dixie's story as the winner with her untitled flash on the danger of eating kale (thank you God), he said -- "A chilling glimpse at a future world where things have taken a very sinister turn. The author drops breadcrumbs to be picked up, and I'd like to sample the full meal. An idea worthy of exploration in much more depth." For her guest post, Dixie has chosen to write about something every writer struggles to achieve -- that all-important Voice. Finding your voice is a big fuzzy buzz in the writing world. 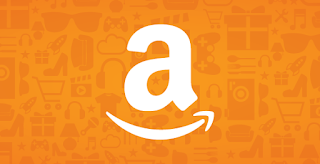 Publishers want it, you can recognize it but how do you get it? Voice is what makes people smile when they read someone’s writing. It is unique to each writer. It feels like the author imbued it with three parts attitude, one part experience and a sprinkling of insight. The word choice, the cadence of how thoughts are put together, it all plays a part. So how do you get there? I used to coach cross country. Most of my family are elite runners. I am an expert observer of the art. When I see someone running down the street, I can tell if they are a serious runner or an occasional putzer. A serious runner’s gait looks different, smoother, their muscles flow in a rhythm unique to them. And even if I’ve never seen them run before, I can tell that they have put in the miles. I can tell a runner’s identity from far down the street, if I’ve seen them run. They have a style, much like a voice in writing. Their body knows what to do and they can focus on the minutiae of movement and mind. They are free to improve in ways an occasional runner doesn’t even consider. You can tell when someone has put in enough words to hone their craft, when they are focusing on the small details that sparkle in our minds, when they open our consciousness in a way it hasn’t been before. So, write. Write a lot. How much is that exactly, Mrs. Jarchow? Darn, I don’t know. I’m too busy writing. I do know that before I got published by Prism/Pelican, I had nine complete novels sitting on the shelf, shall I say, seasoning. I’d won a couple of awards for essays and short stories. I don’t write every day but I do think about my writing every day. Sometimes I plot. Sometimes I plan. Sometimes the spirit of editing overtakes my body and holy cow, things get done. I belong to two writing groups that pretty much meet every week unless the Hell-Freezeth-Over Wisconsin weather defeats our intentions. I belong to them because they inspire me and encourage me to continue writing. They also provide some great characters for me. There is usually coffee involved and the illusion of friendship without serious commitment, which appeals to all of us writing introverts. So join us here at WEP. Write lots. Get better. Be kind to others. It’s the path that matters. 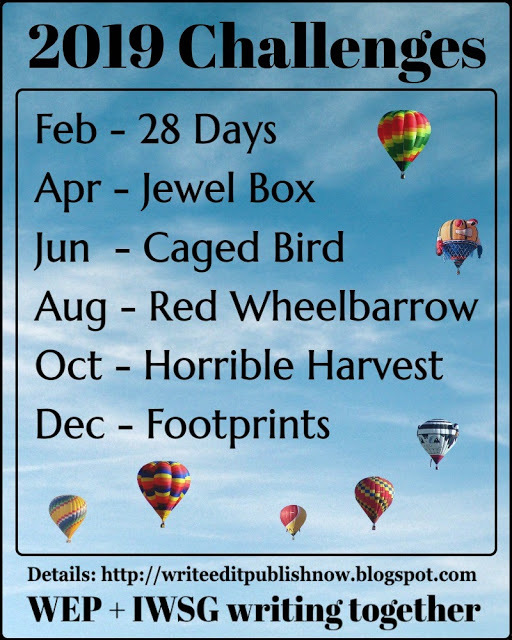 Our April prompt is Jewel Box. Now that should bring forth some interesting entries. 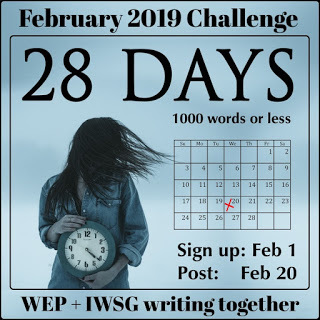 If you're doing the A - Z Challenge and don't want to miss the WEP challenge, try to fit your entry in with the letter of the day. You can begin signing up on April 1 and post sometime preferably before April 17.
Who knows? You could be writing the Guest Post next time! #WEPFF WINNERS' POST for 28 DAYS, the February Challenge. 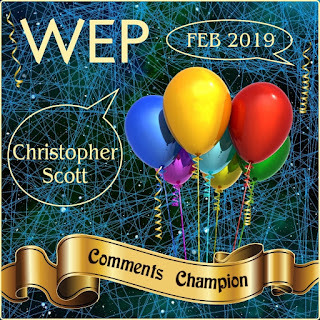 Welcome to the report of the February 2019 WEP/IWSG combined challenge. How were your holidays? Settled into 2019? I hope so. Let's plan for a super productive year of writing. 28 Days, the February prompt, dreamed up by competition winner, Toinette Thomas, kicked off the WEP writing calendar. It was a tricky one for some, but it led to some fresh writing. 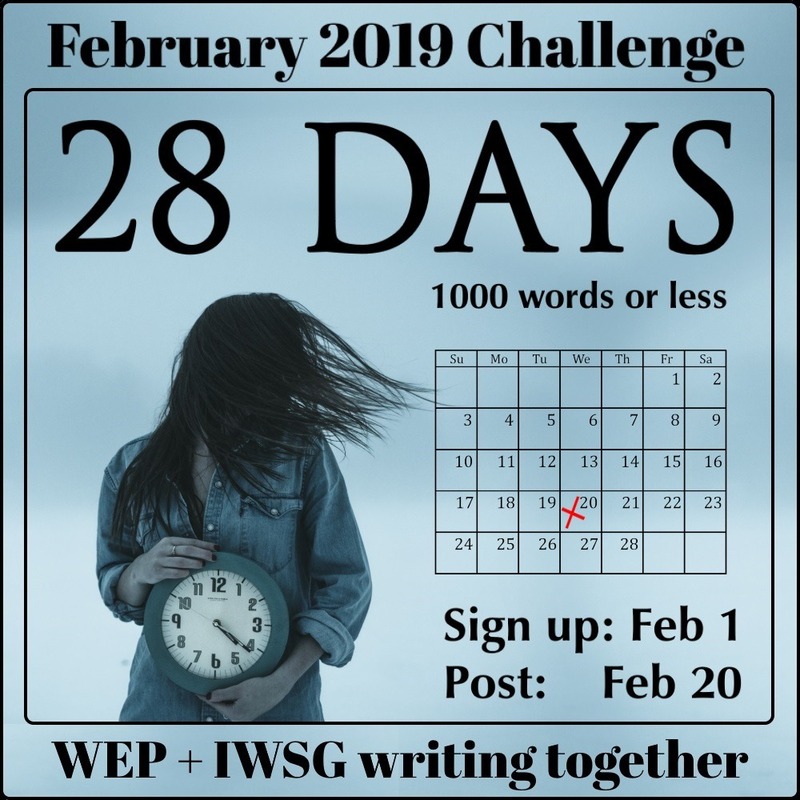 We're thrilled to announce the winners for the WEP/IWSG collaboration for the 28 DAYS Challenge. Thank you for brushing away the cobwebs and posting to the prompt. As always, there's been a lot of discussion regarding our picks for the shortlist here at WEP but finally, we came to agree on a list for our judge, Nick Wilford. Nick's been very busy himself conducting a blog tour to promote his new novel, which Nick said in an interview with the Cynical Sailor: "it was inspired by a desire to deal with injustice and prejudice through the medium of a fictional world." My kind of premise...so I'm happy to give Nick a shout out. Anyone else launching a book? Tell us in the comments. The outright winner of the February WEP will receive a $10 Amazon Gift Card from the IWSG, while another three will have a lovely badge created by Olga Godim to show off on their blog. 28 DAYS was somewhat difficult according to some, meaning we had to wait a little longer for inspiration. But most of you came through with your own unique take. 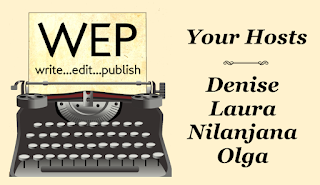 Thanks to our team member, Nilanjana Bose, here is a quick blurb for each entry. Toi Thomas – The blossoming of a friendship ends with the likelihood of loss. D.G. Hudson - An earthling faces a terrible loss and takes a trip into space to heal. Clever and creative use of differences in time on and off Earth. Roland Clarke - Gave us another episode of his detective story with the feisty Sparkle Anwyl and her lover Kama from Tamil Nadu. Roland Yeomans – An angsty teenager gets her own back on high school bullies with her…shall we say unusual foresight? Christopher Scott – An epic battle between the ice queen Beria and flame shaper Cinead, a mythological flavoured prose poetry piece based on current climate issues. Debbie D – crafted a cool poem highlighting domestic violence. Pat Garcia – A soon to be sixty year old kicks off the celebrations of her birth month with a visit to a shop and ends up getting more than she had thought to buy. A charming romantic flash. Bernadette Braganza – Got all of us chuckling with her metaflash on writing deadlines. Tyrean Martinson – A cool flash on a reluctant hero’s journal entries, tackling the horrors of trafficking and revisionism with subtlety and humour. Carrie Ann Golden – A powerful, thought provoking flash where medical science combines with untrammelled greed to play God. Dixie Jo Jarchow – Animals are dying by mass suicide and humans are gorging on the 28th day of the Purge. Something ominous is cooking…you’ll never feel the same about kale chips again. J.M. Weiner – A courageous, autobiographical flash on infertility and its impact on a couple. Rebecca M Douglass – Love on a deadline with an alcoholic Fairy Godmother. 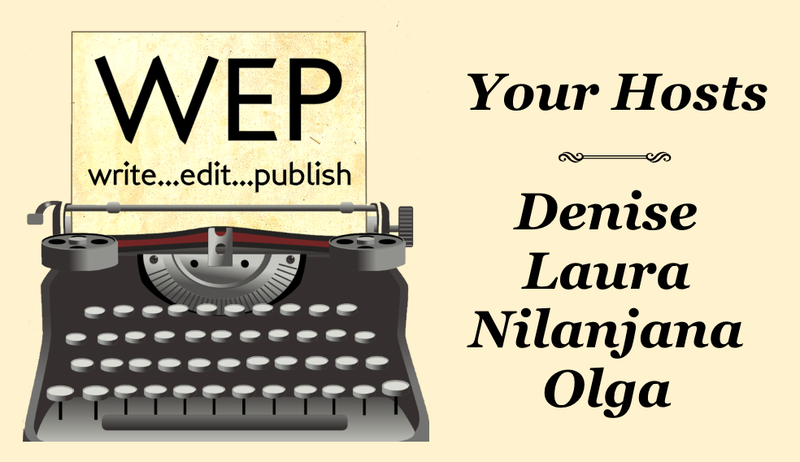 Jemima Pett – An epistolary flash - a trip to Iceland goes horribly wrong. Team Netherworld – A beloved, dead queen laid to rest in an enchanted garden and 28 days to heal and grow a magic tree. Kalpana – A creative and refreshing take on the relevance of numbers versus words. Michelle Wallace – A woman with baby blue eyes at the centre of a web involving three men and a bet. Susan Rouchard - A grandchild tries to bring about a rapprochement between her mother and grandfather before death ends the possibility. Damyanti - An ominous countdown to the end of the MC’s world. Anstice Brown – A powerful flash on child bereavement, addiction and recovery. N.R. Williams - Penned a heart warming flash about a fallible mc trying to overcome her flaws. Dolorah – A fascinating story of blood sacrifice and a Mayan deity. Sally - Gave us a double treat with a poem and a flash on the challenges of growing old as well as its rewards. Michael Di Gesu – A powerful and passionate plea for a more equal, more just, more green world. Jemi Fraser - An artist starts off putting together a portfolio and ends up with darker results than expected. Denise Covey - A harrowing journey over 28 days summing up all the terror of a refugee on the run. L. G. Keltner - A poignant flash about young love that unravels into betrayal. Olga Godim - entertained us with a delightful sci-fi flash about a pet care shop in the Rendezvous Space Station. Nilanjana Bose - an attempt at a photo essay on a trip made in summer 2018. If you didn't make our shortlist, it doesn't mean your entry went unnoticed. Every entry is given consideration, but in the end, there are entries that make the cut. 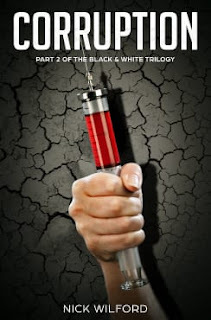 "A chilling glimpse at a future world where things have taken a very sinister turn. The author drops breadcrumbs to be picked up, and I'd like to sample the full meal. An idea worthy of exploration in much more depth." Once again we will also be thanking one of you who took the time to read through all of the wonderful entries and to comment. This is vital to the success of the WEP community. It's our chance to offer support and, when desired, critique that can help us all grow as writers. At last count, around February 24, these were the wonderful ones who qualified for this award as they swiftly read every post. Some have indicated on FB or in comments that they were still reading, so we thank you for your dedicated efforts. It means the world to us to see you supporting your fellow writers! but alas, we can only give it to one deserving individual. 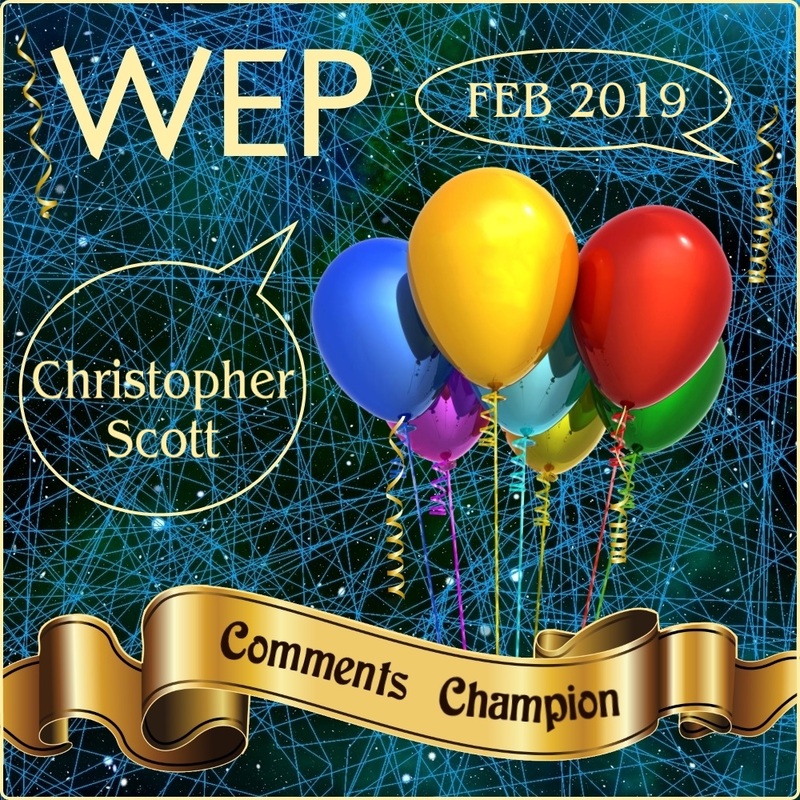 The random pick winner from those who commented most is Christopher Scott! Christopher, please accept the badge on behalf of all the great commenters and display it on your blog! 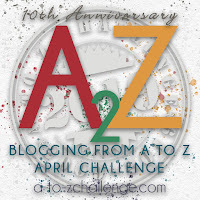 We post during the A - Z Challenge month, April. 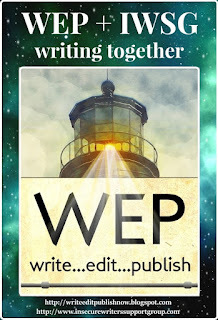 We combine the day's A - Z post letter with your WEP post. 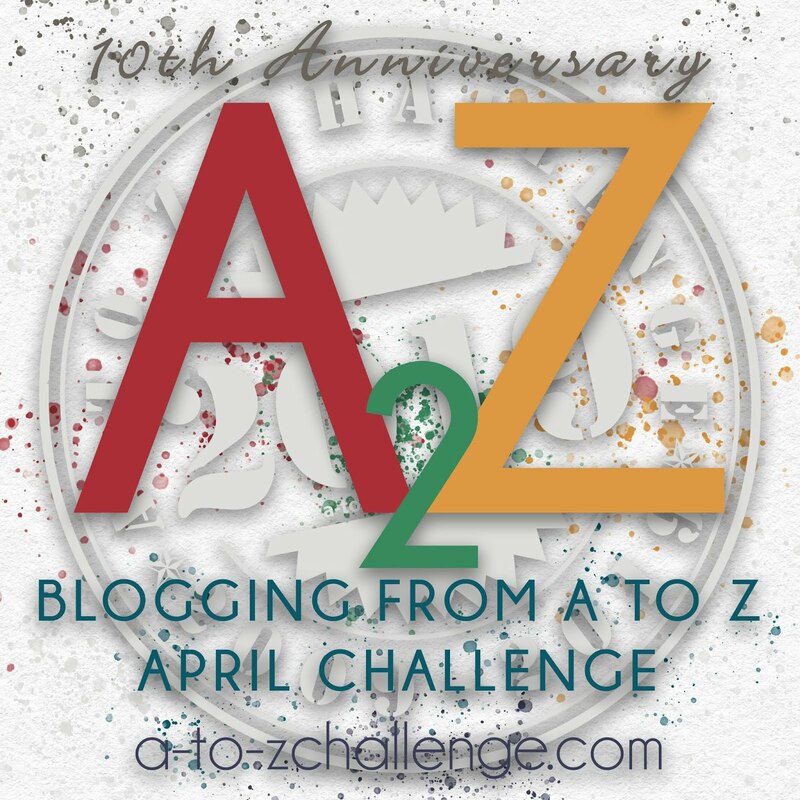 Not everyone participates in the A - Z, but I know some of you absolutely live for it! Start planning your combined post now! Checking the calendar, the 17th April is "Q" which I think would be tricky for Jewel Box. You could post before the 17th with "O", "P" or after with "R", "S". Spurious links welcome!! 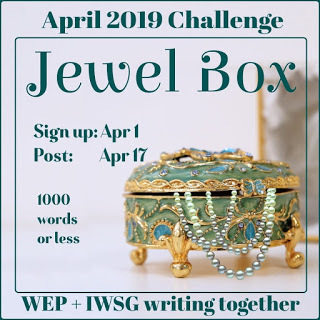 Check out ideas from the WEP 2019 Challenges Page for Jewel Box in our menu.